Because I've started telling people, I am partially out of the closet. But because I have yet to leave the house as a girl, I suppose I'm still mostly in. Last week I did that thing that seems to be one of the hallmarks of a closeted crossdresser: I got myself all girled up and started snapping photos in my room! Sure, it's a bit silly, but I had a lot of fun with it, so who cares? 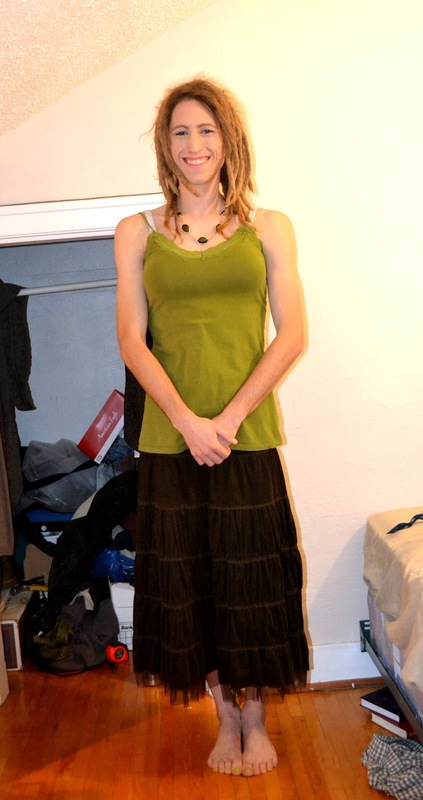 Afterwards I posted a few of the better ones on a crossdressing forum that I occasionally visit. The ladies there are far, far too kind: they all had very lovely things to say and pretty soon I was blushing. I guess compliments make me happy, who knew? 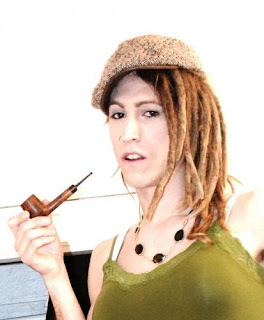 But of course it was about more than just compliments: it was the first time I'd ever really been seen as a girl by anyone, even if it was only over the internet; and their response was an affirmation of who I am. It's surprising how much being seen and affirmed can matter to someone. Me being a tomboy. Someone else referred to this as "criss-crossdressing." I've started school now and it seems to be going well, though it's a little strange being so much older than most of the other students. There's a "queer social group" on campus called OUTreach. Yesterday was their first meeting of the term, and I forced myself to go. I didn't want to. I knew it would be icebreakers and I hate that sort of thing. Though I love people, I am unfortunately very shy, awkward and anxious when it comes to meeting new ones. But I went anyways. And it was good. While I was biking over there I kept thinking, man, I'm gonna be the only person there who's not gay. I also kept thinking man, I'm gonna be the only "boy" with painted nails, since I had applied some sparkly blue polish earlier. And while I was right about the nails, there were a couple of other people there who had queer gender identities rather than (or in addition to) queer orientations. So that was cool. Hopefully in the future I will be able to get to know them better: I really need to have people in my life whom I can talk to about this stuff, and who can understand some of what I'm going through. Overall I'm glad I went. Afterwards though, I couldn't stop thinking about how much I would rather have gone as a girl!